Home / Stock Picks / Dividend Stocks / With AT&T Stock’s Now-Near 7% Yield, Can You Afford NOT To Buy It? With AT&T Stock’s Now-Near 7% Yield, Can You Afford NOT To Buy It? Shares of AT&T (NYSE:T) have seen better days. AT&T stock has dug itself a hole in the debt garden and can’t seem to dig itself out. No matter how many times management reiterates its cash flow outlook and plan to pay down debt, investors just aren’t willing to gobble up AT&T stock. As a result, shares continue to stagnate in this $30 area, leaving it with an elevated dividend yield. That yield has been attractive to me over the past year, as I’ve steadily collected and DRIP’ed that quarterly payout as shares have essentially gone nowhere since last summer. It also forced me to take a closer look at that dividend, wondering how characteristic it was of AT&T to yield 7% or more. Turns out, it’s not very common. 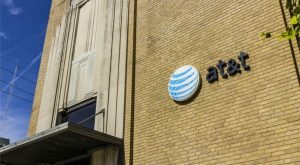 After its recent dividend bump of 4 cents per share in December, it marked another year with a dividend increase for AT&T stock. Not only has the company maintained its dividend payout for more than three decades, but it’s actually raised its dividend for 35 consecutive years. While investors may dislike AT&T stock based on its debt load, valuation, growth profile or any number of other things, its dividend isn’t one to hate on. Management has reaffirmed its cash flow outlook multiple times at this point, and most recently during the company’s earnings report in January. The dividend is safe and in this environment, it’s hard to find a yield near 7% that an investor can actually count on. 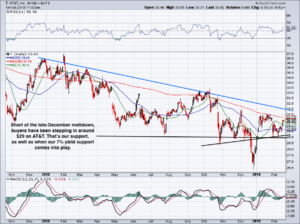 Not only is the dividend reliable, but it could actually suggest a good buying opportunity in AT&T stock. Over the last 30 years, AT&T has only yield more than 6.5% four times. Of those those few times, we rarely got a jump over 7% and when it did happen, it was relatively short-lived. Well, short-lived over the course of a three-decade chart, not necessarily in a few days or weeks. That may give long-term investors some confidence on a name like AT&T, buying below $30 per share. The logic (and hope) being that the yield supports the stock price, so as to protect as much principal as possible. The biggest concern for AT&T stock at this point is the debt. Management has reiterated several times its plan to combat this issue and showed their intentions last quarter. In January, the company’s balance sheet showed it cut long-term debt down to $166.25 billion from $170.21 billion in the prior quarter. Admittedly that’s just a 2.3% reduction in overall debt and $166 billion is still quite the balance-sheet liability. But to reduce its debt by over 2% in one quarter should show investors that management is serious about cutting down its obligations. Further, the deal will improve AT&T’s cash flow, which is imperative to both raising the dividend in the future and paying down its debt. The company is expected to earn $3.64 per share this year, up just 1.7% year-over-year (YoY). On the revenue front, sales of almost $185 billion are expected to grow just 50 basis points YoY. Clearly, AT&T is starving for growth. But investors looking for growth would be better off in a growth-titan, balance-sheet stud like Alphabet (NASDAQ:GOOGL, NASDAQ:GOOG). Instead, AT&T trades at just over 8 times earnings. Its yield of roughly 7% gives investors plenty of cushion and a play on potential upside. T stock is an income play with the potential for slight to moderate capital appreciation should management deliver on debt reduction and cash-flow initiatives. Investors should feel comfortable buying below $30 and preferably closer to $29 per share. Bret Kenwell is the manager and author of Future Blue Chips and is on Twitter @BretKenwell. As of this writing, Bret Kenwell is long T and GOOGL. Article printed from InvestorPlace Media, https://investorplace.com/2019/02/7-yield-makes-att-a-must-buy-stock/.